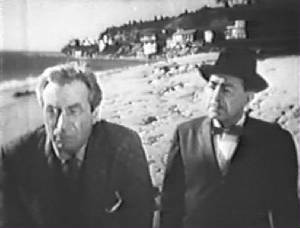 Episode 1: "Your Money or Your Wife"
Copyright 1957 by Vision Productions, Ltd.
Mr. Kramer, a wealthy resident of a beach community, calls on Charlie Chan to learn who is trying to kill him. Soon, Chan and Kramer discover that Kramer's wife, Marsha, is missing and a ransom note that is left behind. Constance Parsons, Kramer's personal secretary, is interviewed, expressing her passionate hatred of Marsha. Andre Patton, an artist who painted a commissioned portrait of Mrs. Kramer tells Chan that Marsha used to be his model and that it was he who had introduced her to Mr. Kramer. Later, Kramer finds a package addressed to him in Marsha's handwriting, containing a tape of her pleading for her husband to pay the $50,000 ransom demanded by her abductors. Police analysis of the tape proves it was recorded at Mr. Kramer's home on his own machine, indicating an inside job. Staking out the location of the money drop, Chan and Lt. Hess follow the shadowy figure who takes the money and who turns out to be Andre Patton. At the artist's studio, Marsha’s lifeless body is discovered with Andre protesting his innocence while admitting to working with her to defraud Mr. Kramer. Soon, an autopsy report indicates that Marsha had been dead for at least eight hours before her body was found. Chan reasons that Patton would not have killed her only to leave her body in his studio and not making an escape. Later, Chan returns to speak with Miss Parsons, telling her of his belief that Andre Patton is innocent and that someone else was responsible for Marsha's demise. Soon, speaking with Mr. Kramer, Chan details his thoughts on the case, suggesting that Kramer may know the identity of the one who actually killed his wife. Back at the beach house, Kramer finds Constance cleaning the residence, noting that she is preparing it for the approaching summer season. Pressed, she admits her guilt, stating that she would do anything for Mr. Kramer, who then pulls a gun to kill her. Chan rushes in and stops him, and taking Constance to the police. As they leave, Constance tells Kramer, "I killed her to make you happy."